Gerber Plumbing Fixtures are one of the top companies when it comes to home plumbing needs. They offer a full line of bathroom, shower and kitchen fixtures whose designs are modern, elegant and contemporary enough to fit in with any kitchen or bathroom decor. One of the most purchased items when it comes to bathroom fixtures is the toilet. This is nothing that most homeowners purchase because they need to and not because they want to remodel their bathroom. Toilets tend to last many years and often we take them for granted. So we don’t replace them until there is a serious problem. These days’ toilets are designed with updated technology that means they last longer with fewer problems. When the time comes to replace that toilet, look into the Gerber Viper Elongated High Performance Toilet. Gerber stands behind every product they sell and the Viper Elongated High Performance Toilet is just one of the best that Gerber has to offer. If you know you are in need of a toilet and you are trying to put it off, take a look at the Gerber Viper Elongated High Performance Toilet and see if this toilet would be an asset to your bathroom. The Viper offers high quality, reliable and dependable service every time. So let’s take a look and see what the Viper has to offer. The Gerber Viper Elongated High Performance Toilet is a low water consumption toilet that has a gallon per flush rate of 1.6 and 600 to 750 grams of bulk waste removal. 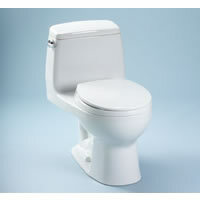 The Viper is not a round toilet but an elongated toilet Model 21-512. This style toilet has a Slim Line Tank. This toilet uses a Fluid Master 400A fill valve and a has a dual feed siphon jet. When you purchase the Gerber Viper you will save money on your yearly water bills. This toilet is not big and bulky it actually measures in at 28-5/8 inches in height x 28-5/8 inches in width x 29-3/4 inches in depth. The water trap way is about 2″ with a water surface of 10-1/2 inches x 8-3/4 inches. The Viper has a water seal of 2-1/8 inches and a water to rim length of 5-1/4″. 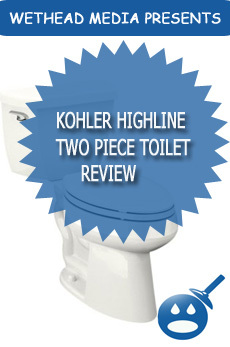 Due to the 1.6 gallons per flush, it is one of the best rated toilets in the industry. You will not only save money but you are also contributing to water conservation too. The main benefit of the Viper Elongated Toilet is that it saves water. It also will provide a reliable and dependable flush every time. Don’t let the low water consumption fool you. Even though this toilet is in fact rated to use fewer gallons per flush, Gerber didn’t lose any of the high quality or high performance of the Viper Elongated High Performance Toilet. The fully glassed trap way has a 2″ opening and has been tested with a 2″ ball and that passed through the system with flying colors. With that being said, you can have confidence that any waste will pass through the system without any problems. You should also follow the same do not throw certain things down the toilet such as cat liter, feminine hygiene products, baby wipes or diapers down the toilet. By purchasing a low water consumption toilet, you can help contribute to going a bit green. At least it is a good place to start. The Gerber Viper Elongated High Performance Toilet is cost effective and is priced around $447.55 but if you shop around either online or at your local plumbing fixture stores you can get a great deal. Gerber has a great reputation for high quality products and high performance fixtures. The Gerber Viper Elongated High Performance Toilet is available in three colors, White, Bone and Biscuit. The Viper would look great in any bathroom setting whether it is a master bath or a guest bathroom. This toilet is designed to last many years to come and by purchasing a Viper Elongated High Performance from Gerber you can be guaranteed a reliable toilet too. Gerber offers a 10-year limited warranty on the Vitreous China and Pressure Vessel and it has a 5 year limited warranty on all other parts. The toilet comes with a complete warranty guide and complete installation guide. You won’t have any trouble when you purchase this toilet. 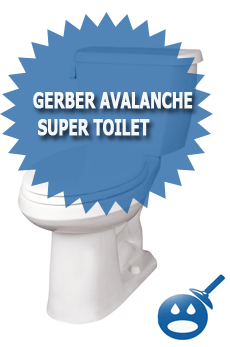 You will get a reliable and long lasting toilet when you install the Gerber Viper Elongated High Performance Toilet.